ALBUQUERQUE, N.M. (WLS) -- A New Mexico man is charged with child abuse and endangerment after allegedly leaving his 2-month-old son in a hot car for more than an hour. Isaac Chacon was seen on surveillance video walking into a plasma donation center at 12:15 p.m. and didn't leave until 1:45 p.m., according to KOAT-TV. Chacon told officers that he'd left the baby alone with a friend, but that the friend left for work 15 minutes before the police arrived. Officials dispute his account. "We don't believe there was anybody there," Albuquerque police officer Simon Drobik said. "We believe that Mr. Chacon went inside the plasma center, left that child unattended for a long period of time." 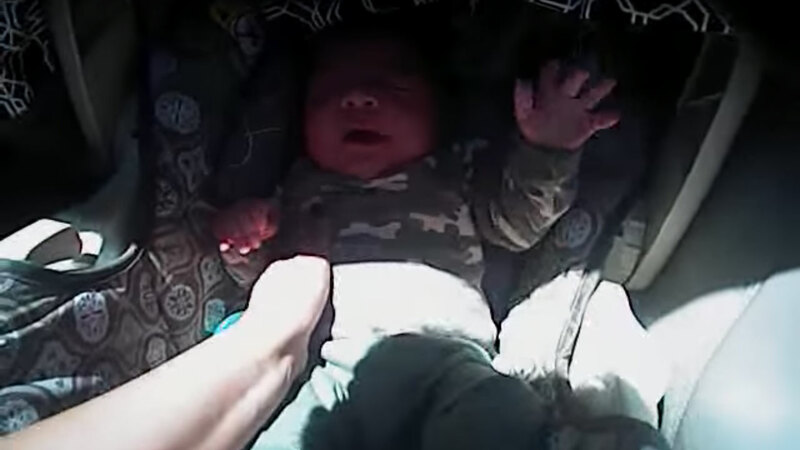 Albuquerque police posted video of the child's rescue to YouTube. The baby's temperature had soared to over 101 degrees, and the boy was rushed to the hospital to be treated for fever and dehydration. Luckily, the boy should be fine. Chacon was also found to be carrying heroin when he was arrested. He was still hooked up to a donation IV when he ran outside. The boy was released into his mother's care.